Blacksmiths are craftsmen that specialize in fabricating objects out of iron through hot and cold forging with the use of an anvil. Blacksmithing takes a lot of time to patience to master, it requires skills, knowledge and a lot of practice. Punching and drifting is one of the most commonly used techniques in blacksmithing. Holes are punched and drifted on a hot iron. In this video, a blacksmith will demonstrate how to correctly punch and drift a square metal bar. Round holes are easier to do, since the tool used to punch the holes are already round itself. However, square holes are a different story. It is harder to do since it requires a series of holes to actually form the square shape. The iron is hot when the holes are made to make the punching and drifting easier. When the metal is scorching hot, it is softer, making the process faster. Watch the video to learn more about the process! 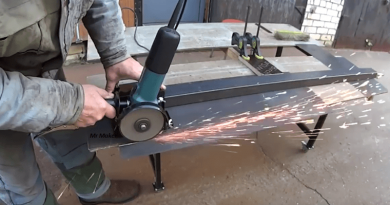 Move on to the Next Page video: Blacksmithing – punching & drifting the square bar. ← Learn How To Make A Basic Wooden Stool With The Awesome Technique!